2 Combine tomato, beans and corn in a medium bowl. Sprinkle cornmeal onto a large baking sheet. Stretch the dough into about a 12-inch circle and lay it on top of the cornmeal, coating the entire underside of the dough. 3 Transfer the crust from the baking sheet to the grill. Close the lid and cook until the crust is puffed and lightly browned on the bottom, 4 to 5 minutes. 4 Using a large spatula, flip the crust. 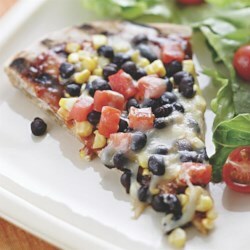 Spread barbecue sauce on it and quickly sprinkle with the tomato mixture and cheese. Close the lid; grill until the cheese is melted and the bottom of the crust is browned, 4 to 5 minutes.